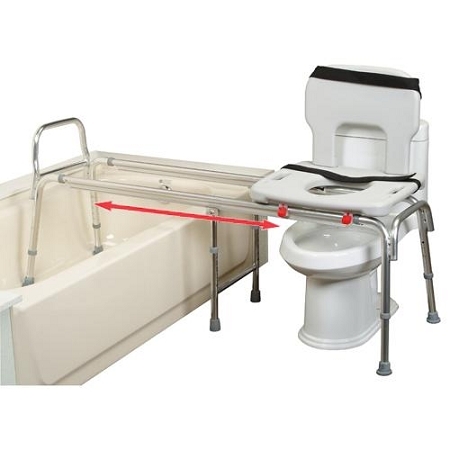 The Eagle Toilet to Tub Sliding Transfer Bench from IndeMedical.com is height adjustable to fit both the user's needs and to clear bathtub walls. A blow-molded plastic seat and back with textured finish provides comfort. 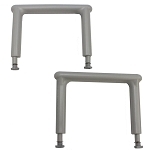 The seat platform slides smoothly over polished, high-strength aluminum tubes. The rust-proof aluminum construction can accommodates users up to 350 lbs. Optional armrest attach easily. Seat Size: 20.25" x 18.5"
Base Length: 63.5" - 64.25"
Base Depth: 20.75" - 22.5"
Back Height from Floor: 33.75" - 37.75"